Turns out that Shattuck Avenue works fine as a party venue. National Night Out is meant to strengthen neighborhoods by getting people out of their homes and connecting with their neighbors. And what better way to do that that with a potluck supper! Tuesday was National Night Out, and more than 50 community and neighborhood groups in Berkeley marked the occasion with potlucks and parties. One of them was in the 1000 block of Shattuck Avenue, where neighbors barricaded the street, set out tables and chairs, brought out all sorts of food, and caught up on local gossip. Berkeley firefighters stopped by the Shattuck shindig, too, to talk about fire safety. In all, dozens of folks turned out, and reports say a good time was had by all. Folks near San Francisco’s Union Square got a chance to see film director Woody Allen on the job Friday. Allen is in the Bay Area shooting scenes for an as-yet-untitled comedy, and on Friday morning he and his film crew were at work outside Shreve & Co. jewelers on Post Street. Other celebrity sightings, besides Allen, include the movie’s stars, actors Cate Blanchett and Peter Sarsgaard. How well do you sing in the shower? The Sonoma State University Chorus is holding open auditions for singers to perform at the opening celebration of the school’s new Green Music Center on Sept. 30. The Green Music Center will have a 1,400-seat theater and is billed as a “world class performance venue” that hopefully will attract tourists and musicians to Sonoma County. It’s modeled on Tanglewood, the summer home of the Boston Symphony Orchestra’s summer home. Auditions begin Aug. 21 on the SSU campus in Rohnert Park, with future auditions scheduled in Novato, San Rafael and Napa. 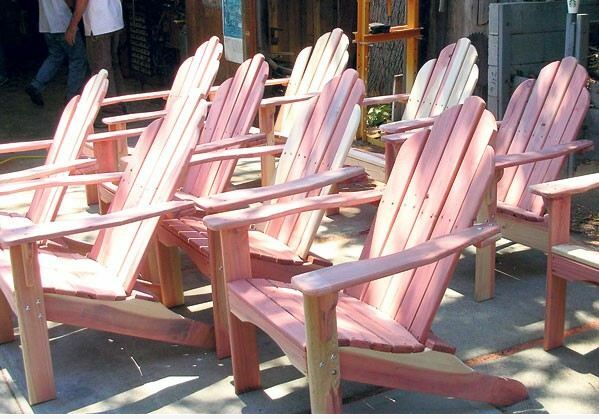 In Napa, Adirondack chairs do double duty as fundraisers. Here’s recycling at its finest: Habitat for Humanity volunteers are making deck chairs from three evergreen trees that were cut down last year at the Orchard Supply Hardware property in Napa‘s Bel Aire Plaza. OSH had said the trees were a safety hazard, but instead of sending the wood to an ignominious end in a chipper the hardware store gave them to Solano-Napa Habitat for Humanity. So far, volunteers have built 30 chairs, all of which sold quickly at $50 apiece at the group’s ReStore shop in Fairfield. By one estimate, there is enough wood left for 70 more chairs. Earlier this year, students at Sun Valley Elementary School in San Rafael tried to push to prod the Crayola Co. to start a recycling program for used felt-tip markers. More than 80,000 people across the country signed a petition, but Crayola said it couldn’t find a way to do it. End of story. Almost. In an unexpected twist, Crayola rival Dixon Ticonderoga heard about the children’s petition and developed its own recycling project. Dixon Ticonderoga announced Wednesday that schools can mail the company’s line of Prang Art Markers back to the company for recycling. Even better, shipping is free when a school collects at least 7 pounds of markers — 250 markers. Among the stars of the London Olympics is Danville‘s Maggie Steffens. The women’s water polo standout scored five goals Thursday to help give the United States its first-ever gold medal. The team has plenty of ties to the Bay Area — coach Adam Krikorian is a Mountain View native, and seven players are from the area — but 19-year-old Steffens led all scorers at the Olympics with 21 goals in six games. It was an awesome Olympics debut for Steffens, who will attend Stanford University in the fall.